Ce document au format PDF 1.7 a été généré par PScript5.dll Version 5.2.2 / Acrobat Distiller 11.0 (Windows), et a été envoyé sur fichier-pdf.fr le 08/04/2018 à 21:20, depuis l'adresse IP 90.48.x.x. La présente page de téléchargement du fichier a été vue 2175 fois. Taille du document: 1.4 Mo (56 pages). auto market penetration curve. Electric buses are already competitive vs conventional, diesel ones. voltage systems (48V). 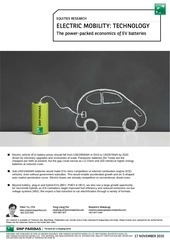 We expect a fast transition to car electrification through a variety of formats. .
Our research is available on Thomson One, Bloomberg, TheMarkets.com, Factset and on http://eqresearch.bnpparibas.com/index. Please contact your salesperson for authorisation. Please see the important notice on the inside back cover. report, we analyse the state of technology and EV roadmaps for the world’s leading battery makers. diesel ones, with compelling economics even without generous subsidies. target improved fuel efficiency and reduced emissions via low-voltage battery systems (48V battery). 4Q16E), while Nidec should benefit from the proliferation of 48V systems. Note: Priced at close of business 13/11/2015. Share prices and TPs are in listing currency. chemistry upgrades and economies of scales. truck, passenger) by various governments. SDI and LG Chem catch up on the technology front. roadmap, leading to steep cost curve. subsidies, and enables an accelerated growth phase and Sshaped auto market penetration curve. out, we anticipate a faster transition to car electrification. Strong sales uptake of EV by consumers. the appeal of EV to consumers. Adverse changes in government regulations and policies. (savings on fuel costs outweigh upfront cost of electric buses). Chinese makers to migrate to NCM battery over the next several years. seems to be a magic number that all major battery makers have in mind. support and compelling economics, electric bus sales are growing quickly in China. become aggressive in building more production capacities. penetration curve in the car market. higher specific energy (Wh/kg) is the priority for long-range driving. has the additional requirement of very fast charge and discharge performance. wins, etc) is likely to be a key share price driver. 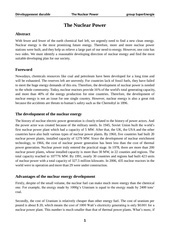 the past decade mostly on its safety aspects rather than increasing energy density. costs (per transistor, per energy). the second is through economies of scale, where physical battery cell cost itself falls. the per Wh cost can fall in line with Wh energy improvement. would be 130Wh/kg, and the 94Ah battery would be 193Wh/kg. Ampere hour and V is voltage. compromising safety, costs, life span, etc. 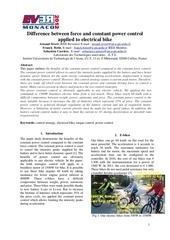 battery as the cathode chemistry mainly determines characteristics of the EV battery. (Panasonic battery) is NCA. The LFP, NCM, and NCA all denote cathode materials. material cost component (40% of battery bill of materials). spinel structure that improves ion flow on the electrode. the 7,104 battery cells in a Tesla Model S going bad would be manageable. notebooks and smartphones. Tesla’s Roadster used LCO despite the drawbacks. handling. Early generation of BEV used LMO. – higher specific energy, higher specific power, and longer life span. allows drawing from the different strengths. offered, in which the metal content of the cathode deviates from the above formula. i3 etc.) use NMC chemistry. stability. However, compared to LMO-NCM, it’s regarded as a less safe battery. energy to 250 Wh/kg in about 4Q17 by adding NCA with its NCM to address 200mile-range battery demand in 2018.
easy to make LFP battery but it is too bulky and heavy for long driving range EV. battery pack ancillaries, given the much higher efficiency of electric motors. ends up at around 500 miles, it would revolutionize the EV industry. silicon anode would take considerable time. Short form: NCA or Lialuminum. Short form: LTO or Lititanate. capacity. One of safest Energy Cell. the electrolyte and electrode materials. volume discounts, and growth of material suppliers. the industry moves along the learning curve. batteries that are already used by US/EU carmakers. large-size EV/ESS battery material supplier base is smaller and prices are higher. with accumulated data and knowhow. generally lower during the early phase of EV battery production. STM (unlisted), which would focus on anodes for EV battery technology. same set of equipment that produces standardized cell. the same cell standard, even if the chemistry and energy density will be very different. future proofing the current EVs. later be easily recycled in ESS (energy storage system) after the EV is retired. could be a larger residual value for standardized prismatic battery. LG Chem guides that it can reach breakeven in the EV battery business in 1H16. LG Chem supplying its new Gen-2 battery. battery in 2021 refers to wholly new chemistry battery category such as Li-Metal, etc. Chem in 2016-2017 would be economies of scale, instead of chemistry upgrade. energy in a strict prismatic can dimension. uses 7,104 battery cells in its Model S.
Gigafactory from 2017, and see about a 10% increase to 5.5Ah thereafter. Gigafactory to bring cost reductions from further economies of scale. exacerbated as there are few recharging stations, and it takes a long time to charge. couldn’t be formed without heavy government subsidies and regulations. established luxury ICE (internal combustion engine) cars. assuming the same number of battery cells that current BEVs have. the BEV can be price competitive with ICE, even without government subsidies. generous government subsidies, the compact EV has limited traction. components, such as brakes, suspensions, wheels and tires, and bumpers. smaller number of parts to assemble. more expensive than its ICE counterpart, but the gap will have narrowed significantly. By around 2025, we expect ICE and EV prices to converge. We believe xEV will be critical in automakers’ effort to meet emission regulations. The CO2 emission regulation target in EU is 130g/km by 2015, and 95g/km by 2020.
manufacturer has to pay an excess emissions premium for each car registered. EUR95 for each subsequent g/km. From 2019, the cost will be EUR95 from the first gram of exceedance onwards. 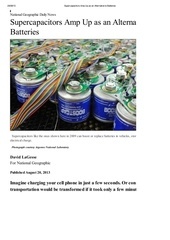 faster improvements in battery efficiency and cost than seemed likely five years ago. battery cost curve projection actually materializes. the largest EV market globally. Automotive Industry Data; EV Obsession (Jose Pontes); BNP Paribas estimates. (13,131 units) are fully electric. numbers are Research In China estimates). Golden Dragon Bus (not listed) and Zhongtong Bus (000957 CH, not rated). 448,000 units in 2015. We estimate 13% of the market will be electric buses. consecutive years to meet the extra operating costs of new energy vehicles. gallon, natural gas buses averaged only 1.7 miles per gallon). pollution in major cities (fewer diesel buses). battery pack, most other electric buses have smaller batteries. essential for bus operators to obtain transport permits. drive no less than 200km continuously when tested under a 40km/h method. which is similar to the total global 2014 EV market size. 4,800 electric bus batteries (250kWh). supplies its battery to the largest electric bus maker Yutong among others. The composition of cathode chemistry compound can change the battery type. would improve specific power (W/kg). PHEV and HEV would be more expensive than batteries for EV. in whatever form this plays out. expected to exceed 60m units by 2023.
function reduces fuel consumption by stopping the engine when idle (idling stop). cannot actually drive the motor. gasoline engine and the electric motor. and Nissan (7201 JP) Leaf. well as EVs and PHEVs. HEVs and feature systems that improve fuel consumption by up to around 30%. consumption targets may be imposed to reduce CO2 emissions to 95g/km by 2020. So what are the benefits of introducing 48V systems? We see five main advantages. body lighter, thus making fuel consumption even more efficient. with the same size of motor). and above, but no such measures are needed with 48V mild HEVs. convertor to provide electric current. future; but, 48V mild HEVs have significant price benefits for the end-consumer. of strong HEVs or PHEVs, so they command even higher price premium. much easier choice to make. use of 48V systems for auxiliary components like superchargers and water pumps. reduced further when 48V is used for both main and auxiliary systems. demand from European luxury vehicle OEM companies to improve efficiency. power supply. Radiator cooling fans may also be suited to the use of 48V systems. use of 48V systems for these parts. automakers are requesting 1kW products for larger vehicles. considered where output above 1kW is needed. Switch to 48V unlikely as higher revs and smaller motors with 48V systems may reduce valve life. Ce fichier a été mis en ligne par un utilisateur du site. Identifiant unique du document: 00585066.